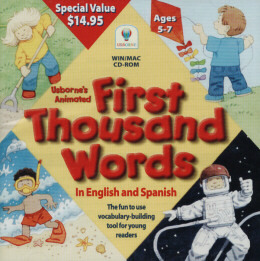 Is the fun-to-use vocabulary-building tool that introduces pre- and beginning readers to 1000 common words in English and in Spanish. In 35 colorful scenes, young learners discover 6 interactive games that offer meaningful ways to see, hear, say andplay with words and pictures. Based on the best-selling Usborne book.